The other day I was looking down the path at Wat Opot and saw something that looked like a really weird cat! It was smallish and just didn't look right. I 'barked' which makes our dogs Ben and Lucy, look around to see what they should chase off the property. Well, Lucy ran off towards the gate, and right past the animal! One of the boys laughed and said it's really a ghost animal. I decided to walk down there and see what it was and came upon the saddest little creature imaginable. It looked like an anorexic rat! But it wasn’t, it was a puppy that had not been taken care of in a long time. He was sitting in our small pond and I just couldn't believe how awful it looked. I tried to get him to come out and he was just shaking. I told Rortana to run and get some food for him. I tried to keep him on the property, as he was trying to run through the gates. He wouldn’t eat the food and just wanted to leave. I finally let him go and went back and asked the kids if they knew who he belonged to. Come to find out he was the 5th grade teacher’s dog and he didn’t want him anymore so he dumped him at the Wat (temple) next door. I ranted a bit to the kids about the bad teacher who let an animal get so bad and then just dumped him off. Not a very good human! The kids said that the puppy hangs out at the school so I sent some of the kids to the school with animal carrier and they came back with him. He was friendly to the kids, but understandably wary of adults. I put the dog down and let him run off and went to shower. The dog kept his distance, but stayed on the property. He had to have known I was trying to help and not trying to kill him. The next couple of days we fed him and as he slowly trusted me I was able to give him another bath. 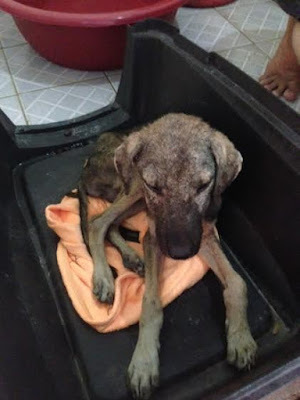 A few days later, we took him into the city to PPAWS and they gave him his shots, de-wormed him and clean him up more. They estimated him to be about 4 months old. He’s back here on an antibiotic and I’m applying loads of climbOn crème all over him. He’s looking so much better and is starting to play with Ben and Lucy. He will be ready for adoption once he’s a little fatter and much cuter! UPDATE: A few days later and he's really looking good! I love how he holds his head up high now! He's fattening up nicely and taking his med's like a champ. He's doing so well, that I can't get him to sit still for a photo. But it seems the word got out...that Melinda is a sucker for strays. Look who showed up and is making herself at home. But, I'm not buying the whole "feed me I'm homeless" bit on her. I think she just wanted a little rubbin' behind the ears and perhaps a cooler place to sleep. If it’s not stray dogs, it’s pigs!